How do I stop my cat from scratching the furniture? Is your cat scratching your furniture? 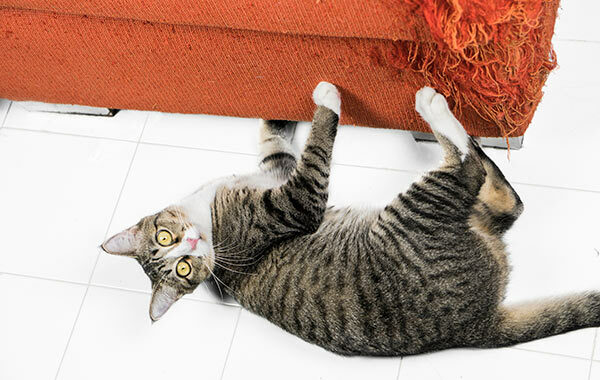 Find out how you can stop your cat from using your furniture as a scratch post. Scratching is a normal and natural behaviour. Cats need to scratch to keep their claws in good condition, to mark their territory, and to help stretch their muscles. However, this normal behaviour can become an annoying habit when your cat chooses to scratch your furniture as an alternative. 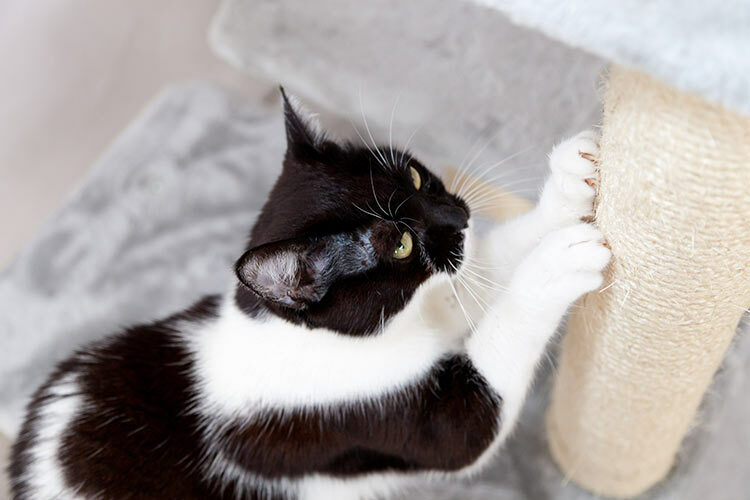 Often, owners purchase scratching posts that are too short, too unstable, and have unsuitable material, which leads to a cat finding a more ‘suitable’ place to scratch. Should I get a vertical or horizontal scratch post for my cat? When considering suitable scratching posts, it will be necessary to provide your cat with a few alternatives — both vertical and horizontal. A vertical scratching post should be tall enough for your cat to stand on his hind legs at full stretch, and strong enough to withstand his weight. Cats often direct scratching to carpets and furniture for claw maintenance because they need a surface that will catch on their nails in order to pull off the old lose sheath. Try wrapping an old towel or piece of carpet around the post, which should give him something extra to dig his claws into. A range of horizontal cardboard scratchers should also be provided. Cats often scratch after sleeping, so position the new scratching post near to where your cat usually likes to sleep. Should I tell my cat off for scratching the furniture or carpets? It is very important to note that if you catch your cat scratching the carpets, do not communicate with him. Giving him attention (whether positive or negative) will serve to increase this undesired behaviour. Instead, reward him with petting, treats, praise, and attention when he approaches a scratching post or if you catch him using it. The important thing to remember is to reward the behaviour that you want to see and do not reward the unwanted behaviour. This is a good question because a lot of cat owners find themselves in the same position. Cats can have quite strong preferences for the kind of materials and places they scratch. We have to find out what they like and then encourage them to make the switch from sofa to scratch post. Sofas are padded, and a lot of cats like the way their claws punch through and catch on the fabric. As they pull their claws out of the padded fabric, it removes any loose pieces so the claws are fresh and sharp. Raking at the fabric is also nice for the cat, because he can see the marks he has left. So, if we want to displace the clawing onto a scratch post we need to simulate the same sensations. If you are using the classic sisal-wrapped scratch posts then it is possible to make them more attractive. 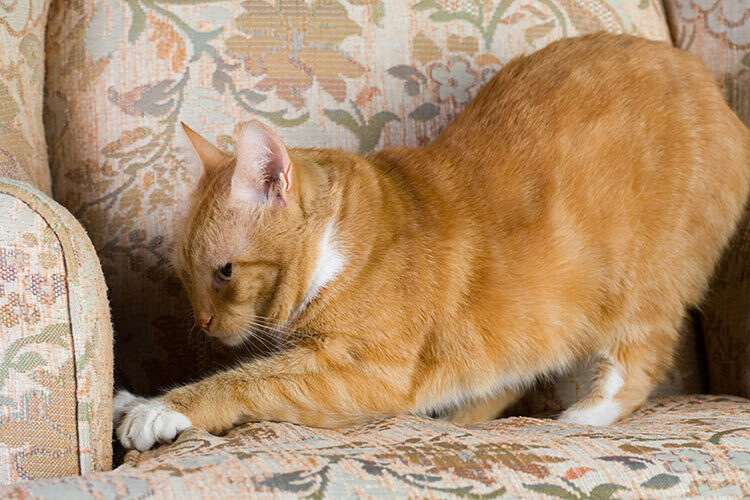 Rub the post against the sofa where your cat currently claws. This will pick up any scent marks your cat has left. Then attack the sisal with a wire brush to leave lots of marks that make it look like a cat has clawed the post before. Can I use anything to deter my cat from scratching furniture? Position the scratch post right in front of where your cat currently scratches the sofa. 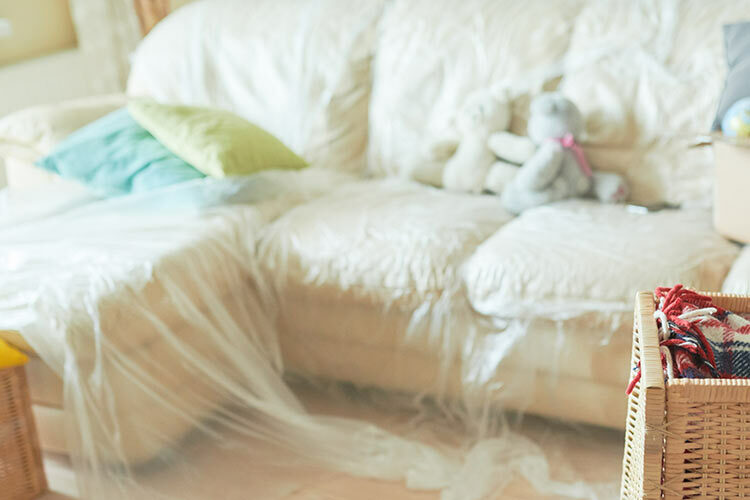 Protect the sofa with some heavy-grade polythene sheeting for a couple of weeks until your cat has got into the habit of using the post instead. Applying a feline pheromone spray to the sofa can help act as a deterrent, but be careful not to get any on the scratch post. It is still possible that your cat won't like the sisal rope on the post, because it is coarse and irritating. In that case you may need to be a bit creative and modify the scratch post to suit your cat. Remove the sisal and upholster the post with fabric and padding so that it is more like the sofa. Choose a fabric that is similar in texture to what is on the sofa, but striped so the stripes can run vertically in the manner of claw marks. Scratch the surface with a wire brush to roughen it up a bit. One last thing: always make sure that you take notice of your cat when he uses the post so that he gets attention for scratching there. Some cats claw specifically because it gets a reaction from their owners, and if you don't encourage him he will find something to scratch that you cannot ignore.